Digital nGenuity provides a complete suite of network management services including design and implementation, managed services, evergreen planning, virtualization, WiFi access, hardware supply, and superior levels of support. Your company's network is critical to your business. With technological advances come updates and new strategies to communicate with remote offices, customers and suppliers. As such, it is beneficial for businesses to optimize not just the design but also the performance of the network, keep it running at its best, increase application performance, lessen network downtime, and meet the latest network requirement to capitalize on efficiency. Your business needs scalability, security and reliable infrastructure that support applications which make use of data, voice and video. 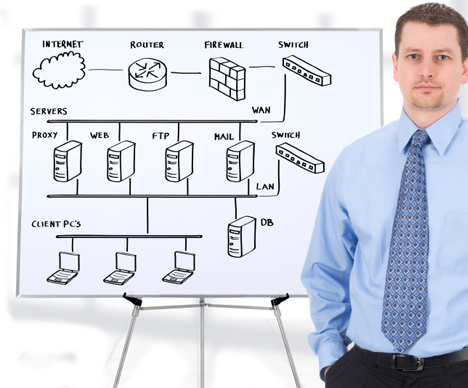 In order to compete effectively, you need proper network management to fuel business growth. At the Digital nGenuity, you can enjoy excellent network performance, leverage the full functionality of your network infrastructure and customize the network management services you receive to meet your business needs and comfort level. What we can Provide for you. Our Managed IT Services approach is highly flexible, allowing you to choose specific IT components to be managed, or alternatively, outsource the entirety of your IT infrastructure. You also have the ability to tailor the service levels in a way that works best for you and your business. Digital nGenuity provides a full range of networking services including initial analysis and planning, installation and implementation, support and even employee training sessions. The technicians at Digital nGenuity are fully trained and qualified to support Novell and Microsoft networks. Plus, our years of practical experience will assure you of superior quality with no hassles. Virtualization is not just about servers. Digital nGenuity can help you create an efficient, responsive IT environment by virtualizing your servers, storage and workstations to enhance productivity and simplify IT management. With an appropriately planned and executed virtual environment you can lower capital, power and cooling costs, reduce management touch points and accelerate IT service delivery to your users. With the stronng relationships we have with the major hardware suppliers we can provide the best in hardware to complement evergreen planning for your company to avoid the problem of IT obsolesence. Digital nGenuity can help you plan system, server, switch, and other network infrastructure renewal based on a strategic evergreen plan. Backups, Disaster Recovery, and Business Continuity are closely related practices that describe an organization's preparation for unforeseen risks to continued operations. At Digital nGenuity we would be pleased to discuss the various levels of complexity involved and help you determine what you will get for your investment. Digital nGenuity Support Services deliver comprehensive technical support for a variety of businesses. With rapid response, senior-level support, and a state-of-the-art customer support system - Digital nGenuity puts it all together in a complete technology Support solution specifically designed for your organization. Setting up a robust Wi-Fi network for your business doesn't have to be a nerve-racking experience. There's a big disparity between the cost of consumer access points (AP) with business-centric models from leading manufacturers. Confused by what may appear to be similar specifications, small businesses may opt for cheaper consumer-grade Wi-Fi APs that are, in fact, inadequate for the task at hand. Nonbusiness APs typically lack advanced capabilities in crucial areas such as security, manageability, load management, remote deployment and upgradability. Let Digital nGenuity help design and install your wifi network to ensure a robust, secure, and easily managed wifi environment.